This entry was posted on Tuesday, November 29th, 2016 at 5:49 pm. I’m back! Sorry I’ve been so sporadic with my posts – the fall has just gotten away from me. A week in Disney threw me off, and then I blinked and Thanksgiving was upon us! 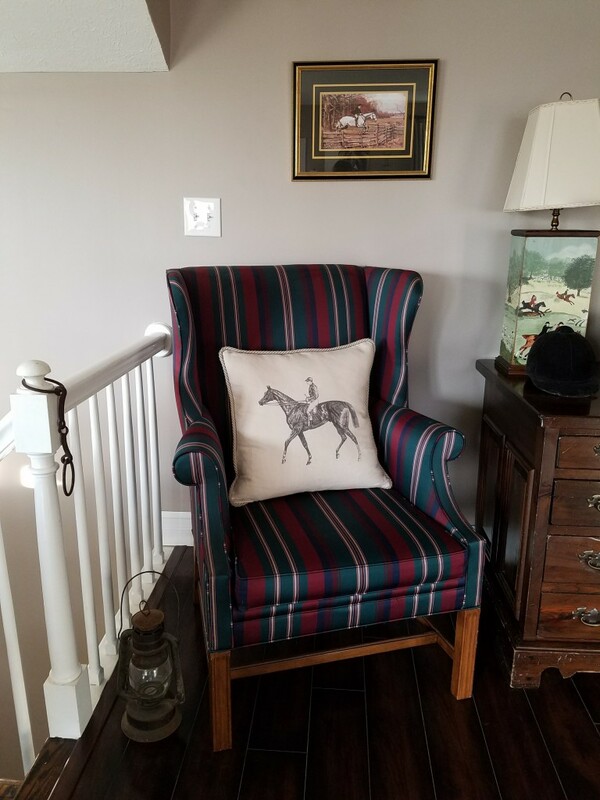 Anyway, today I’m going to share some pictures of my living room – specifically, this is the area I call my “Reading Nook.” As you know if you’ve been following this blog, my husband and I bought our fixer upper in 2013, and we’ve been updating it room-by-room. The living room is basically done (minus some random things like crown molding at some point), so I wanted to share this space with you. This is an odd section of the room, and I, initially, had a bookcase in place of the desk, and it just didn’t work. It felt kind of hodge-podge-y, if that makes sense. Last year I relegated the bookcase to my husband’s office (where it goes nicely! ), and replaced it with the hand-me-down desk that came from my mom. 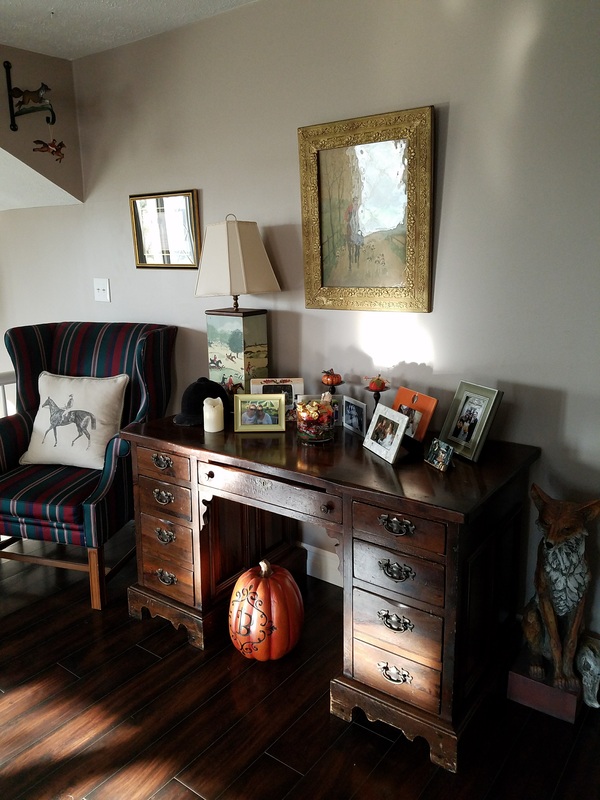 And speaking of hand-me-downs, that’s the best part of this area – just about everything pictured came from a yard or vintage sale or was a gift! 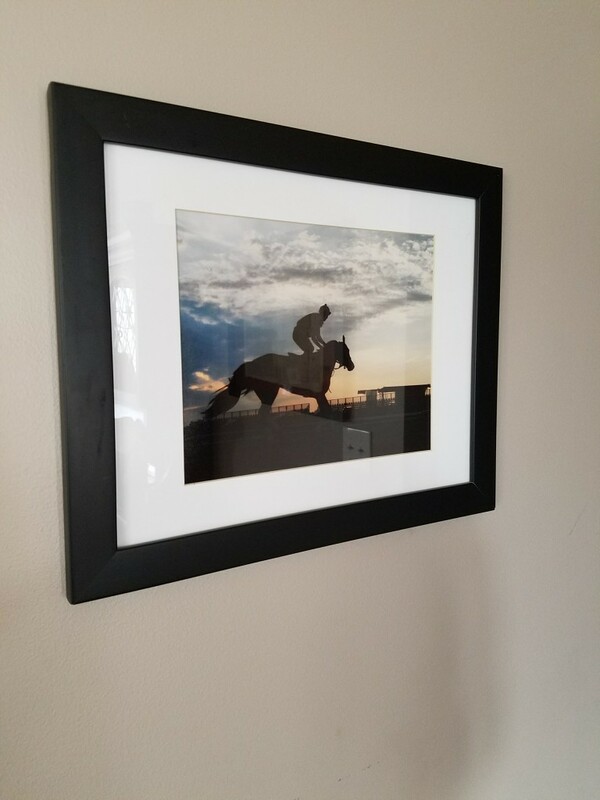 The horseracing photo was one my husband took a few years ago when he was covering Preakness week. I’m not sure who the horse is, but this is during morning work-outs. The picture in the middle was purchased at a local vintage sale, and the Voss print on the left was a gift. The chair is the most expensive item shown ($200) at that same vintage sale. 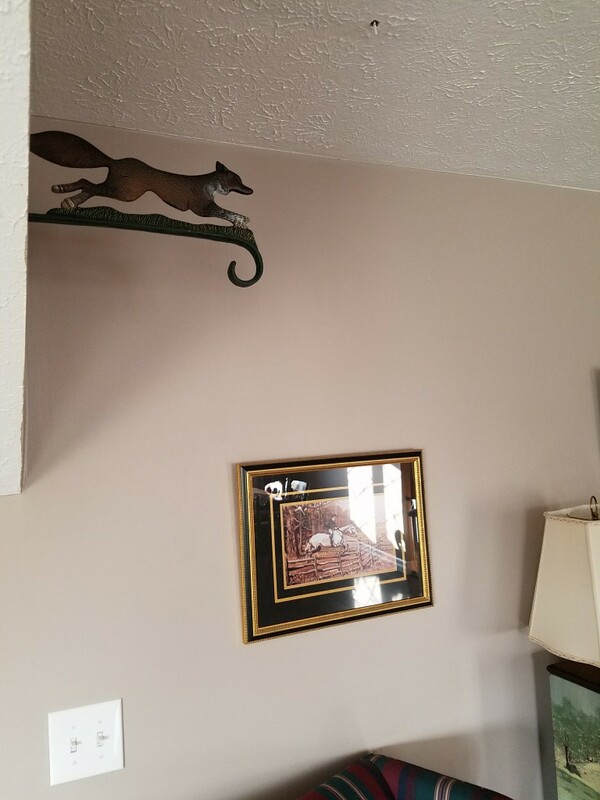 The metal fox hanger was a gift and, I think, adds some structure and rounds out the space. 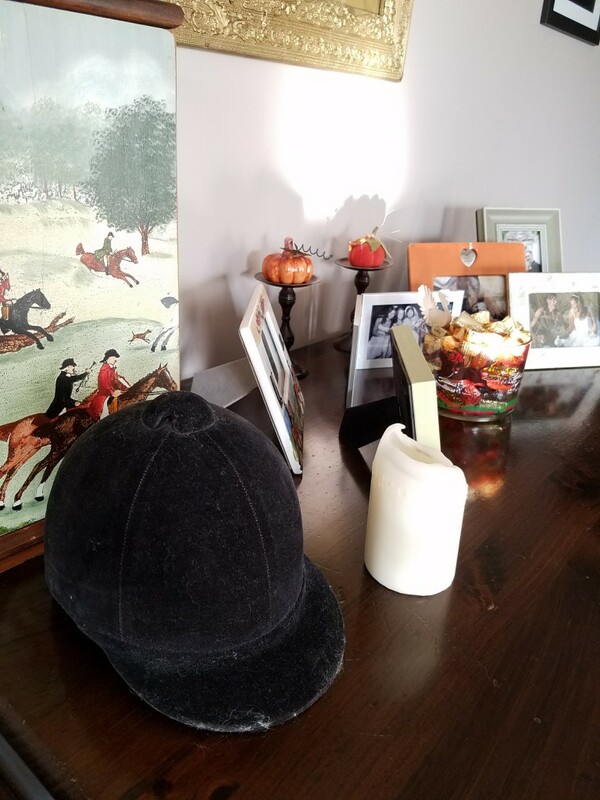 My favorite item pictured, however, is the antique hunt cap. I bought this for $1 years ago at a neighbor’s estate sale. It had belonged to her father who was a foxhunter. 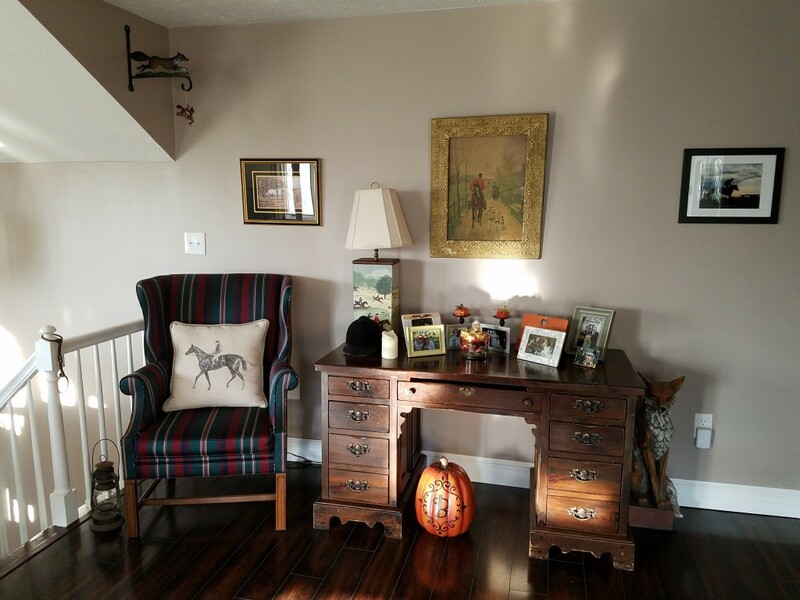 Other antiques include the snaffle bit hanging on the post and the lantern on the floor next to the chair. Finally, one last splurge was the standing fox statue on the end. 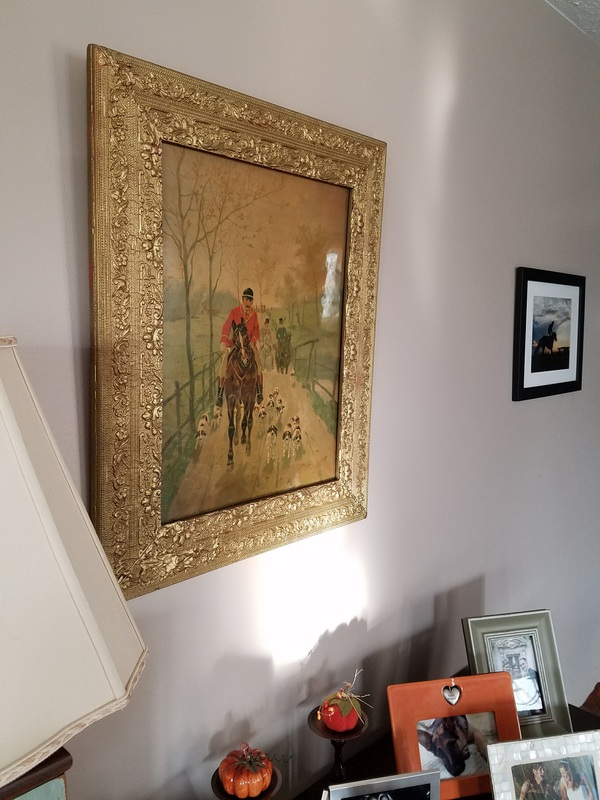 I named him Sir Edward because he looks so regal; he came from Plow & Hearth and was purchased for $90. I will share more pictures of my living room later this week! Thanks for stopping by!